Yojana and Kurukshetra magazines are the two most important components of study material that you require for RBI Grade B and NABARD Grade A 2019 Exams. 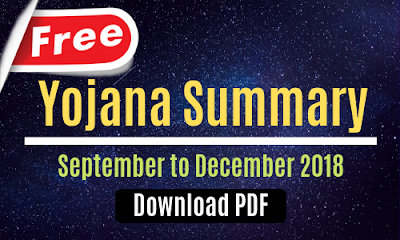 Therefore, we are sharing a combine PDF of Yojana Magazine Summary from September 2018 to December 2018 which will help you cover important topics from the year 2018. This PDF demonstrates the hard work we put in while preparing our study material and it is just a drop in the ocean of contents we offer in our paid courses of RBI Grade B and NABARD Grade A. Or use BankExamsToday android application. Check the first section "Yojana Summary: September -December 2018"